​As 2017 wraps up, Delta and U.S. Customs and Border Protection are launching the latest test project at Hartsfield-Jackson Atlanta International Airport that aims to enhance the customer experience, add to Delta's biometric pilot projects across the network, and make boarding seamless for customers and gate agents alike. Beginning this week, at gates E10 and E12, customers will be able to use facial recognition to board flight DL82 from Atlanta to Paris. Customers can opt-in to participate — if they opt-in, they simply approach the camera as their picture is taken, receive their confirmation receipt and board the flight. The test will also allow agents to more easily engage with customers during the boarding process. The experience is planned for expansion to multiple daily flights as testing continues. This test is a natural next step for gates E10 and E12, where customers are already participating in a Biometric Exit test with Customs (CBP) when boarding the aircraft, which launched earlier this year. "This project represents the latest development of our biometric testing and innovation strategy that has been underway for several years. 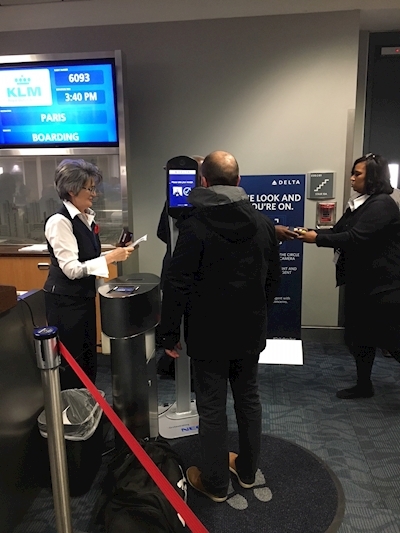 In Atlanta and across the country, we are pioneering a number of new innovations to enhance the customer experience and provide more tools for Delta people," said Gil West, Delta's Chief Operating Officer. "CBP has been a great partner and we are looking forward to honing this new way to board with them as a part of this test project." Added in February, CLEAR helps ease security lines in ATL, and 23 other airports across the country. Customers can speed through security with just the touch of a finger or blink of an eye. U.S.-based SkyMiles members get exclusive pricing on CLEAR membership through Delta's partnership with CLEAR. Eligible SkyMiles members who are enrolled in CLEAR can forego a paper or mobile boarding pass in favor of using fingerprints as proof of identity to enter the Delta Sky Club at ATL-B, in addition to tests at DCA Delta Sky Club and boarding. Handheld Nomad devices now enable employees to assist customers on the go throughout the airport. This new tool enables more personal engagements by enhancing mobility, and can check-in, change seats, rebook flights and print boarding passes and bag tags. Customers traveling through gates T1-3 can test out the redesigned gate and boarding experience, which includes Nomad devices for agents, boarding pillars to enhance organization, self-boarding e-gates and mobile agent pods. SkyMiles members can earn miles for Lyft rides in the U.S. — and even more miles on those traveling to and from the airport, giving SkyMiles members another way to earn miles through their everyday activities. Customers who use the Fly Delta App can enjoy several new updates during their travel – the app now automatically checks in eligible customers 24 hours prior to their scheduled departure, and customers can track their bags in real-time using Delta's award-winning RFID technology, and use maps for wayfinding in ATL and other airports. Click here view and download as pdf.